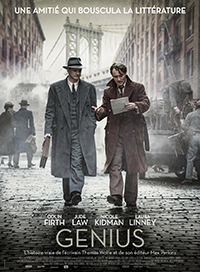 When, one day of 1929, writer Thomas Wolfe (Jude Law), decided to keep the appointment made by Max Perkins (Colin Firth), editor at Scribner's, he had no illusions: his manuscript would be turned down as had invariably been the case. But, to his happy amazement, his novel, which was to become "Look Homeward, Angel", was accepted for publication. The only trouble was that it was overlong (300 pages) and had to be reduced. Although reluctant to see his poetic prose trimmed, Wolfe agreed and helped by Perkins, who had become a true friend, with the result that it instantly became a favorite with the critics and best seller. Success was even greater in 1935 when "Of Time end the River" appeared, but the fight for reducing Wolfe's logorrheic written expression had been even longer, with 5,000 pages, Perkins managed to cut 90,000 words from the book, and bitter ultimately taking its toll, the relationships between the two men gradually deteriorating. Wolfe did not feel grateful to Perkins any longer but had started resenting him for owing his success to him. otsoNY Comments: None of the film was shot in New York, and instead the cities of Manchester and Liverpool in England were used along with the use of computer wizardry to show the Empire State Building in the background.